where portability, connectivity, and usability are key assets. As the Android tablet's presence expands, businesses are hungry for applications that address their needs and problems. 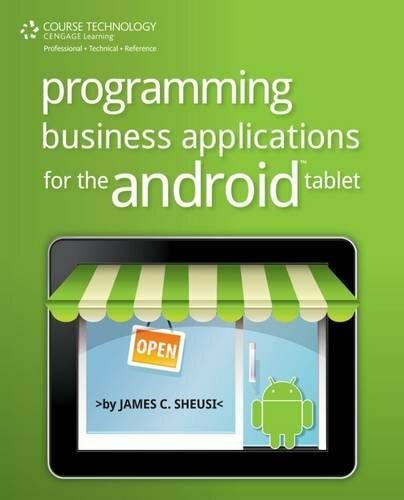 In PROGRAMMING BUSINESS APPLICATIONS FOR THE ANDROID TABLET, James C. Sheusi provides a quick start for prototyping applications on the mobile platform for the business applications programmer--focusing on such common business uses as database management, web-based user interfaces, and graphic representation of data. With step-by-step instruction and plenty of examples, the book includes: a guide to installing and configuring an Android development environment--and an Android device emulator--on your personal computer, all the code necessary to create several simple applications demonstrating the capabilities of an Android mobile device, full explanations of the methodologies used in the examples, a guide to publishing an Android mobile application, and exercises and recommendations for further study. PROGRAMMING BUSINESS APPLICATIONS FOR THE ANDROID TABLET is the perfect guide for learning a real-world marketable skill developing for the Android tablet.